Activists organize in Berkeley a year after Kayla Moore’s death in police custody. This project was a collaboration between the Investigative Reporting Program at the UC Berkeley Graduate School of Journalism and The Daily Californian. The lawsuit and police reports refer to Moore by masculine pronouns, but the Daily Cal refers to Moore by feminine pronouns, which was her preference. 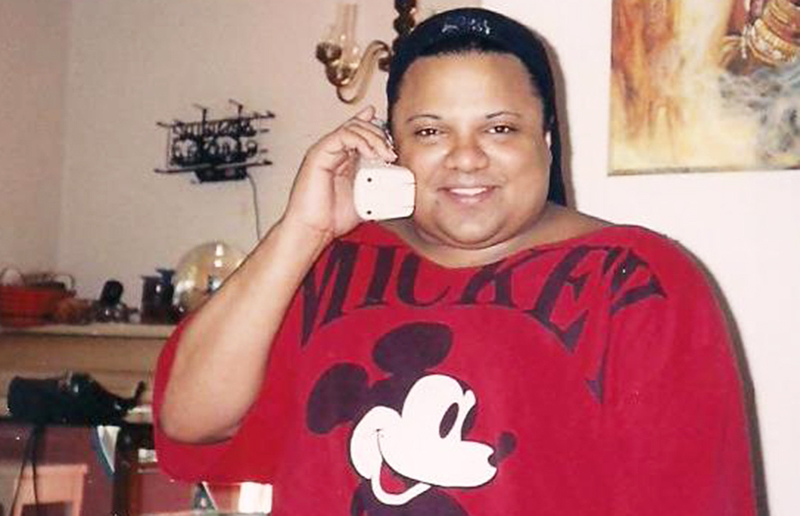 On Feb. 12, 2013, police responded to a disturbance call in Downtown Berkeley that ended with the sudden in-custody death of Kayla Moore, a 347-pound black transgender woman with a history of mental illness. 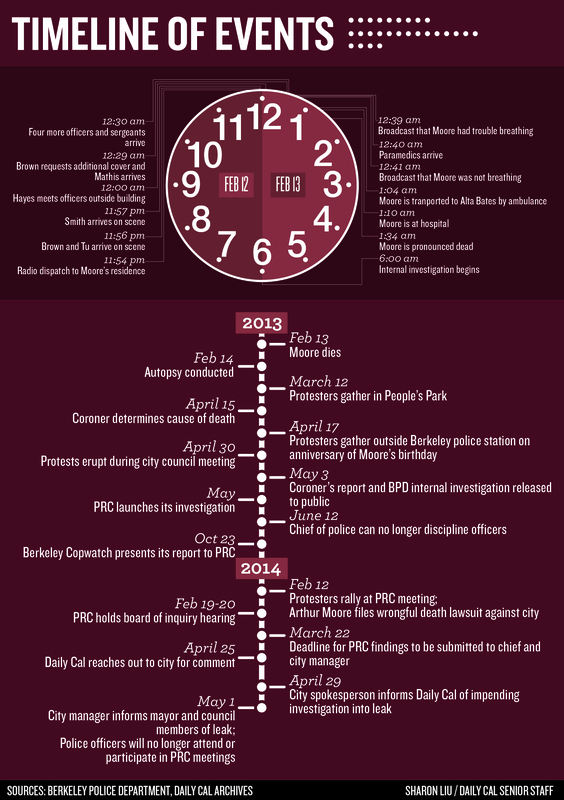 Although an internal investigation conducted by Berkeley Police Department determined that none of the officers present that night were at fault, Moore’s death prompted intense criticism of the police department. Members of Moore’s family and the community — along with LGBT activists and a police watchdog group — have protested City Council meetings, marched through Downtown Berkeley and demonstrated in front of the police station. Accusations flew that Moore’s death was caused in part by officers’ alleged transphobia and racism. The deceased’s father, Arthur Moore, filed a wrongful-death lawsuit in February alleging that police “unlawfully seized, restrained, arrested and battered” his daughter, resulting in her death. 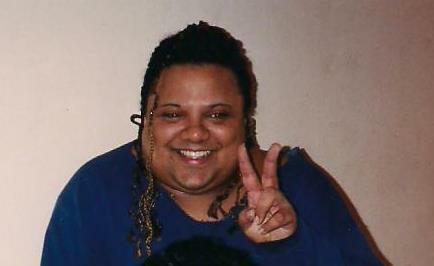 A coroner’s report released in May 2013 determined Moore’s cause of death was a toxic intersection of methamphetamines and codeine, complicated by cardiovascular disease and obesity. Police maintain that officers committed no wrongdoing. The only information from the commission’s findings previously disclosed to the public omitted the names of officers and the nature of the allegations, which prompted protests at Police Review Commission meetings. In her testimony during the internal investigation, Brown said Moore never mentioned she was hurt or having trouble breathing. Brown could not be reached after multiple requests for comment. The commission, which is not a court of law, also heard testimony that at least one officer believed the outstanding warrant for which Moore was arrested may have been meant for a different person. Although the commission did not ultimately come to a majority finding on this point, the leaked testimony showed a discrepancy among officers’ accounts of the night. The commission’s findings were sent to the city manager and the chief of police in March. But because they were submitted more than a year after the incident, the chief was not permitted to discipline any officer based on the findings due to an agreement between the police department and the union that represents BPD officers. The city has filed paperwork to dismiss the wrongful death lawsuit. After the Daily Cal reached out to the city and police for comment on the leaked report, the city launched an administrative investigation through its human resources department to determine how the information was leaked. Unionized police officers have since refused to attend PRC meetings, and the union has urged the city to launch an independent criminal investigation into the leak. Just before midnight on the night of Moore’s death, her roommate, John Hayes, called 911 and told the operator that Moore had kicked him out of their apartment. According to police reports, Hayes said Moore was “violent,” “aggressive” and needed to be “5150’d,” referring to a law that allows police to take a person into custody for a mental health crisis. According to testimony included in BPD’s internal investigation, which was made public last year, officers reported that Hayes said Moore had been “drinking and doing drugs all day.” Hayes also told police that Moore was a schizophrenic off her medications. Once BPD officers Brandon Smith and Kenneth Tu, along with Brown, arrived, Hayes unlocked the door to his fifth-floor apartment on Allston Way, near Shattuck Avenue, for police to enter. Brown called out “Xavier” — Moore’s legal first name — and Moore came to the door. Brown attempted to engage Moore in a conversation, but Moore was speaking incoherently, according to the internal investigation. Brown made a physical motion to Tu that they should take Moore into custody and announced, “Well, Mr. Moore, you have a warrant, and we need to go take care of this,” according to the internal investigation. While Smith was downstairs arresting Hayes on a separate outstanding warrant, according to the internal investigation, Brown and Tu moved in and grabbed Moore’s hands in an attempt to handcuff her. Moore drew her hands back, pulling the officers forward. All three fell onto a mattress in the living room. Moore was partially on her stomach, according to the internal investigation. Brown and Tu struggled to handcuff Moore and requested the help of additional officers via radio. Ultimately, eight officers and sergeants arrived at the scene. They used two sets of handcuffs on Moore and a wrap device to restrain her leg movement, according to the internal investigation. Finally, after five to 10 minutes of struggling on the mattress, Moore stopped resisting. Soon after, Brown realized Moore’s chest had stopped moving. Officers moved Moore from being partially on her stomach to completely on her side. About a minute later, officers observed she was no longer breathing and had no pulse, according to the internal investigation. Tu began chest compressions, while Brown kept Moore’s airway open and called for a CPR mask, which provides a protective barrier and makes mouth-to-mouth resuscitation more efficient. The lawsuit filed by Moore’s father alleges that officers could have saved Moore’s life with mouth-to-mouth resuscitation. It also alleges that Moore’s status as a transgender woman was a factor in the officers’ decision not to perform the breathing without a mask. When investigating allegations claiming police used force improperly, commissioners were required to consider each officer’s individual physical contact with Moore rather than their combined force. The commission did not sustain any improper-force allegations. The internal investigation that was released last year showed a discrepancy between two officers’ accounts of the night, which testimony heard by the commission also affirmed. Prior to arriving at the scene, Smith ran a records check for “Xavier Moore” on a computer system in his car. A $10,000 warrant out of San Francisco came up, according to testimony heard by the commission and the internal investigation. Smith relayed the information to Brown after arriving at the scene. Later, Smith learned Moore was about 42 years old, according to his testimony in the internal review. Smith realized that the age listed in the warrant was for a person roughly 20 years older than Moore’s estimated age. In two separate testimonies, Smith told both BPD investigators and the commission that he informed Brown of the age discrepancy. But during her interview with BPD investigators, Brown said she believed the $10,000 warrant was for Moore and acted according to that mindset. She also maintained that she would have taken Moore into custody regardless of the warrant because of Moore’s erratic behavior. During its board of inquiry into the police actions that night, the commission considered whether Brown “lacked sufficient knowledge to effectuate a valid arrest on the warrant,” among other allegations, but did not sustain the allegation, with two commissioners voting to sustain and four voting to not sustain. The commission investigated each of the six officers who physically interacted with Moore to see if he or she committed the same procedural violation as Brown. Although allegations were not sustained against any other officer, the board voted 4-2 that Tu did not properly monitor Moore’s vital signs, according to the leaked findings. Five out of six votes were required to sustain allegations in the Moore case. In a typical death case for which the commission holds a board of inquiry, all nine commissioners are present, and five out of nine votes are required to sustain an allegation. But in the Moore case, one commissioner was on sick leave, and two commissioners recused themselves because they did not think they could vote impartially. Had the commission used a simple majority — four out of six — the allegation against Tu would have also been sustained. 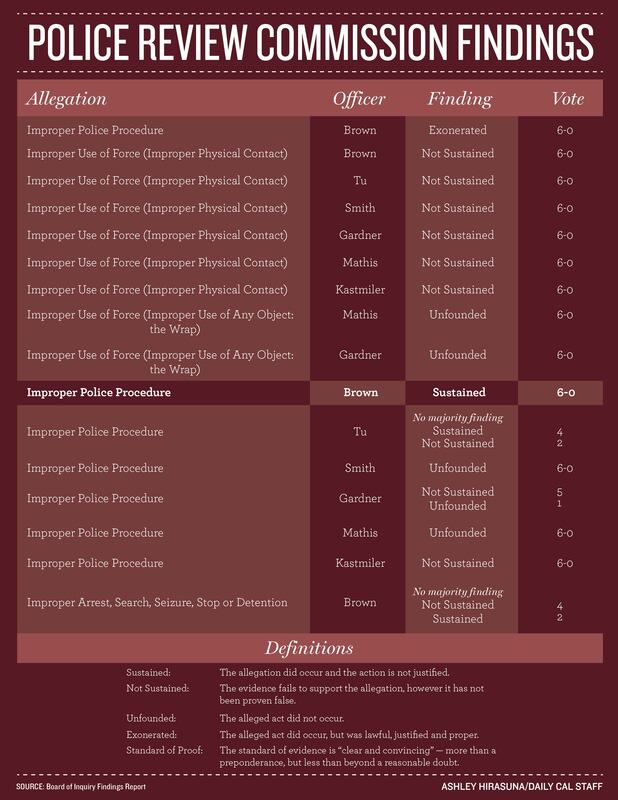 The internal investigation ultimately concluded Moore was in violation of California Penal Code Section 69 — resisting an executive officer — which is a more serious version of resisting arrest. According to the commission’s investigation, none of the responding officers had gone through crisis-intervention training, a program that teaches police how to deal with people experiencing a mental health crisis. Since the incident, BPD has expanded the number of officers who receive the training. As of February 2013, nine officers had received the training. Today, there are 24 officers who have completed the program, according to BPD officer Jeff Shannon. Last week, UC Berkeley’s student senate unanimously approved a bill in Moore’s memory that highlights a need for greater mental health services in the city. The commission’s findings ultimately bore no weight in the police department. Regardless of which allegations were ultimately sustained, BPD Chief Michael Meehan was not permitted to discipline any officers based on the commission’s findings, because they were submitted more than 120 days after the incident occurred. Meehan declined to comment due to the ongoing lawsuit. The commission could not begin its investigation until BPD’s own internal review was complete, which happened in May 2013. PRC officer Katherine Lee said collecting testimony and evidence in the Moore case was particularly lengthy. Kimberly Veklerov is the executive news editor. Contact her at [email protected] and follow her on Twitter @KVeklerov.